Humans have a long history of map-making that can be traced back to cave paintings older than 20,000 years, and detailed maps made by the ancient Romans, Greeks, and Chinese. These maps tell the story of exploration and changing borders of states, countries, and populations. This screenshot shows our Geo-Wiki tool for collecting data from the crowd. Until recently, military and government mapping agencies have been entirely in control of mapping, but this is changing. The rise of neogeography and user-generated geo-referenced content online has led to a new generation of community-based maps such as OpenStreetMap. Enabled by interactive web technology (Web 2.0) and the GPS in mobile phones, people are now mapping different aspects of the Earth’s surface through crowdsourcing. This new model has proved its worth in cases like the post-disaster recovery, e.g. the devastating earthquake in Haiti. Even in this age of satellites and space technology, it is far from easy to generate good automated representations of the Earth’s surface. While satellite imagery has allowed us to create global maps of land cover—the various materials such as grass, trees, water, and cities that cover the Earth’s surface—at various resolutions from 10 km to 30 m, there are two main problems with all the different products that are now currently available. The first is that these products have accuracies that are only between 65 to 75%. Secondly, when they are compared with one another, there are large spatial disagreements between them. If you are a user of these products, which one should you choose? How can you trust any one of these products when they have uncertainties as large as 25 to 35%? And more importantly, without good baseline information about the Earth’s land cover, such as the amount of forest or cropland, how can we possibly predict what will happen in the future? Our Geo-Wiki project aims to solve this problem through crowdsourcing. With open access to satellite imagery through Google Earth and Bing Maps, citizens and interested experts can help us better characterize land cover, to correct existing land cover maps or build new ones. Geo-Wiki is a simple set of tools to sample the Earth’s surface, which allows a network of Geo-Wiki volunteers to tell us what type of land cover is visible from Google Earth or Bing Maps. 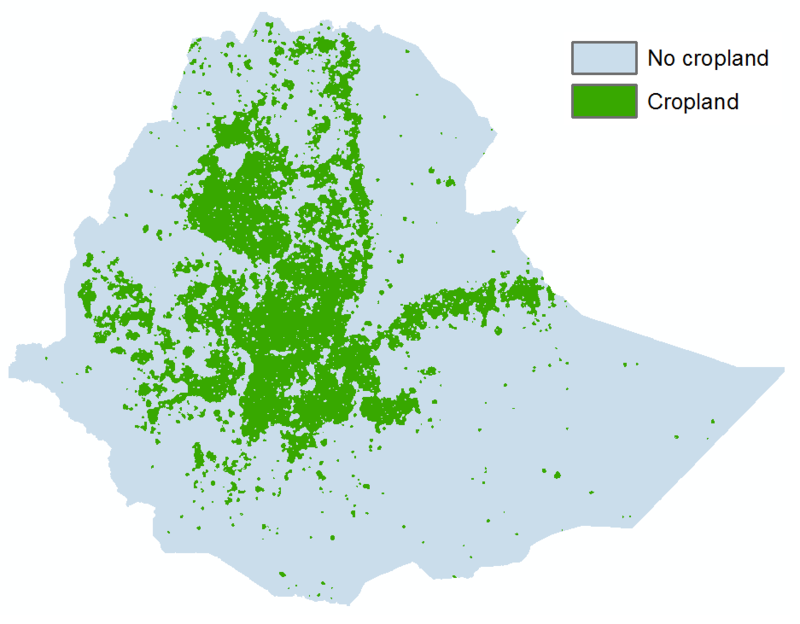 This map of cropland in Ethiopia was created from crowd-sourced data. See, L. McCallum, I., Fritz, S., Perger, C., Kraxner, F., Obersteiner, M., Deka Baruah, U., Mili, N. and Ram Kalita, N. 2013. 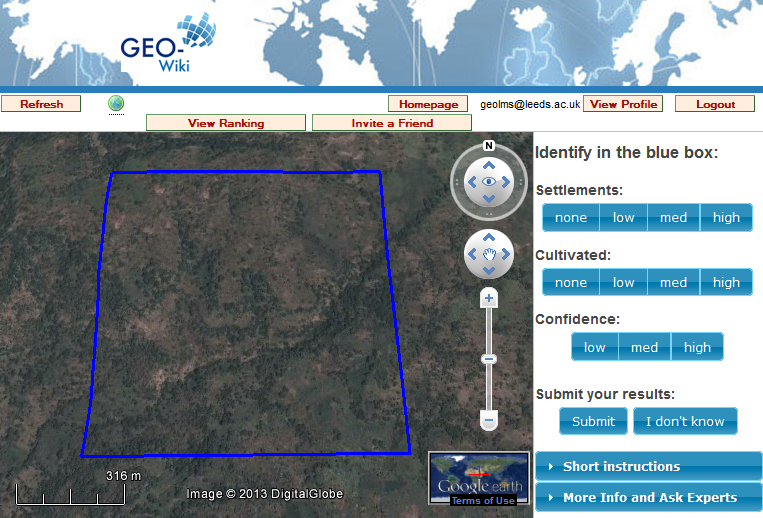 Mapping Cropland in Ethiopia using Crowdsourcing. International Journal of Geosciences, 4(6A1), 6-13 http://dx.doi.org/10.4236/ijg.2013.46A1002. The Ethiopian example is just the tip of the mapping iceberg. As more citizens get involved in mapping land cover online—for example with our Geo-Wiki Pictures app, we could revolutionize land cover mapping in the future. If you are interested in helping us improve land cover, register at http://www.geo-wiki.org or find us on Facebook to join our crowdsourcing network and learn more about upcoming crowdsourcing campaigns.